They say a picture is worth a thousand words – so perhaps this photo of a gorilla at Paignton Zoo Environmental Park in Devon says it all. Western lowland gorilla Kiondo is 14 years old and weighs in at 186 kilos. He came to Paignton Zoo from Stuttgart Zoo in 2006; he was born on 11th October 2002. The photo was taken by Paignton Zoo regular Miriam Haas. 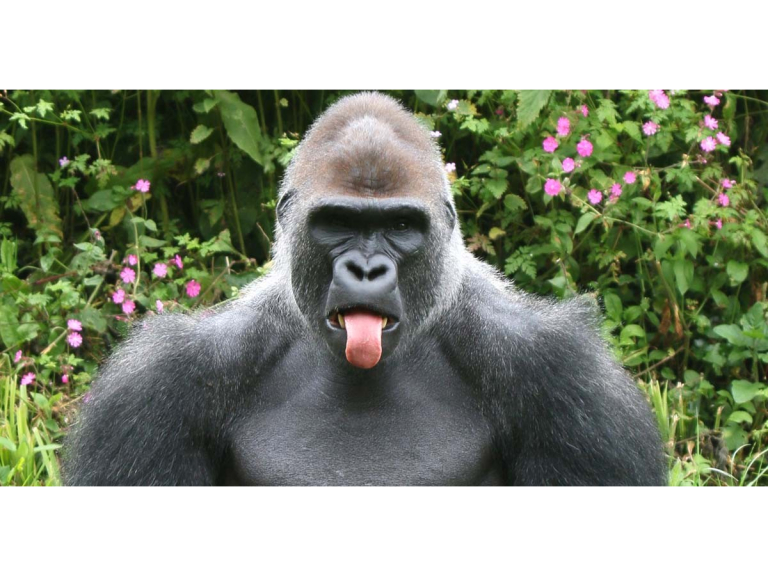 Like humans, gorillas use all their senses to communicate – sight, sound, touch and smell. They grunt, rumble, adopt various body postures and pull faces to indicate mood. And, while Kiondo is using his tongue, this definitely falls into the category of non-verbal communication. The charity’s bachelor group of Western lowland gorillas – a Critically Endangered species - plays a vital role in international gorilla conservation, providing somewhere for young males to grow up in a social environment. Some may move on to be the dominant males in bachelor or family groups in other collections as part of the European breeding programme. Paignton Zoo Environmental Park is a registered charity. For more information go to www.paigntonzoo.org.ukor ring 01803 697500.